Have you stopped to think why flowers are so attractive, so appealing to the human eye?. There is much more symbolism in holding a flower in your hand, even the most modest daisy, than just a blade of grass or a branch, maybe an olive or a laurel branch could have some, but there are certainly a lot of unconscious or subconscious concepts, images, dreams, memories triggered in our mind by the mere contemplation of some beautiful flowers. Notice that I don't mean just the effect of colors but also the influence of shape and textures. Take this bouquet I found at Las Ramblas. It is exuberant, isn't it? In what sense? I changed the colors on purpose just to see the effects playing with different channels in Photoshop. The flowers kept looking beautiful in all of them. Maybe it is just the light falling on those petals or the voluptuosity of the turgent bulbs that remind you of lips and so on? I don't know. I finally decided to keep a touch of color but with a burnt sienna layer on top that makes it look like a canvas and much more artistic perhaps. The hypnotic effect is still there though and I can't explain why. Can you? Perhaps it is not just the look and the colour but maybe the smell as well ? Very nice, the muted colours work really well! I wish I knew how to photoshop! Wonderfull bouquet ... very cripsy and lovely details, did you use a flash ? Who could beat "...the voluptuosity of the turgent bulbs that remind you of lips...."? Wow. For me, these flowers look like old souls full of memory. They have such a short time to be beautiful, and they "know" this. -Yes, I used the camera flash. Thanks for you kind comment. I absolutely ADORE ranunculus flowers! 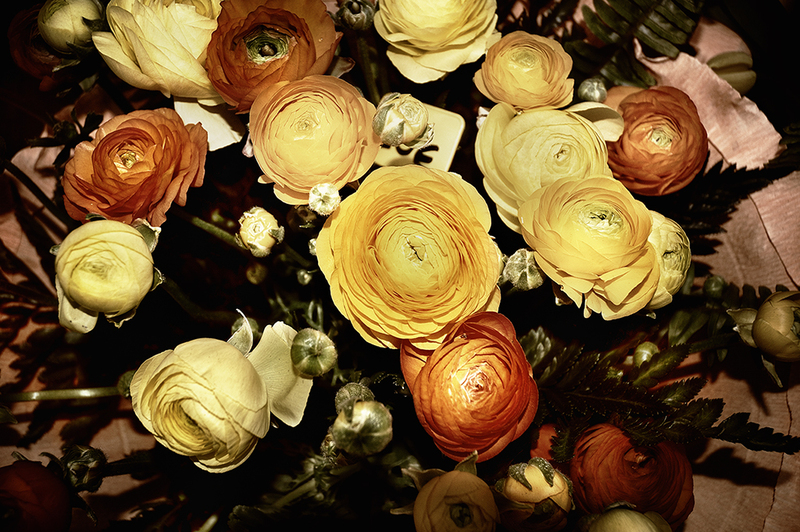 There's something about their stiff rose-like form that seems edgier and louder than a traditional flower. They're actually related to the buttercup family!